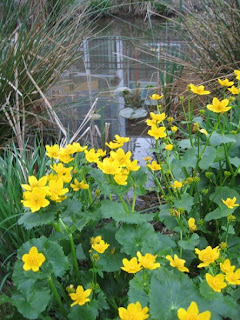 There are a number of very tall wildflowers that thrive in sunny, wet ground. Cutleaf coneflower can grow to ten feet. Joe-pye-weed, late-flowering thoroughwort and native sunflowers can reach impressive heights in late summer. But one plant is already towering over me in the backyard. 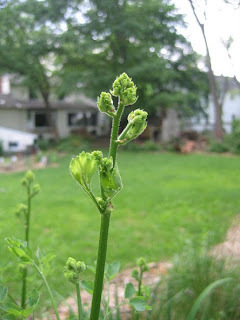 In the photo is the growing tip of Tall Meadow Rue (Thalictrum pubescens), which, growing at the rate of 2 inches a day this spring, has now reached a height of seven feet, with no sign of stopping. Tall meadow rue plays a role that is complementary to the boneset described in detail last July. Both grow into vegetative high-rises topped by masses of white flowers that attract a surprising diversity of insect life, with meadow rue doing its work early in the season, and boneset reaching maturity in mid-summer. Even before flowering, the meadow rue is serving as substrate for the life cycles of the local insect community. These seeds were trying to sprout in a planting tray. 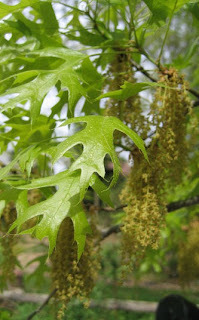 Maples manufacture an elegant device for propagating themselves--a so-called "samara" that is part seed, part wing. The wings catch the air in such a way as to rotate like a helicopter, slowing their fall and allowing the wind to carry them some distance away from the parent tree. The photo shows three stages, progressing from left to right. 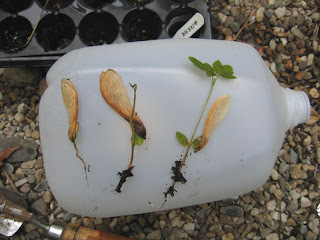 The seed sends out a root, then its first leaves--cotyledons--expand and turn green, then it forms its first pair of "true leaves", which have the classic maple leaf shape. Spring flowers have faded, summer has yet to begin, but one small tree on Snowden Lane is filling the void. 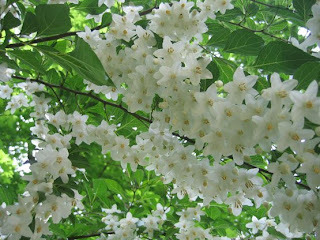 Japanese Snowbell (Styrax japonica) is showy in a private way, aiming its blooms downward. The second photo was taken looking up from underneath the tree. 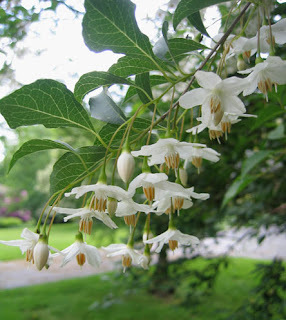 There's a native Styrax that grows in the southeast U.S. If you're having trouble getting water from a stone, try getting tulips from a tree. 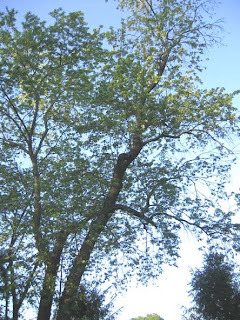 It's a lot easier, in fact hard to avoid if you have a tulip poplar growing nearby. 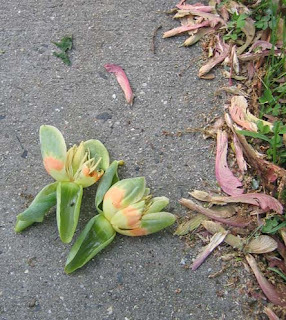 Among all the maple seeds spinning to earth these days are a few tulip-shaped flowers from what scientists affectionately call Liriodendron tulipifera, a native closely related to magnolias. It's usually so tall that you only see the flowers after they've fallen from the vaulted canopy, but I noticed a specimen on Maple Street with some low branches laden with flowers. 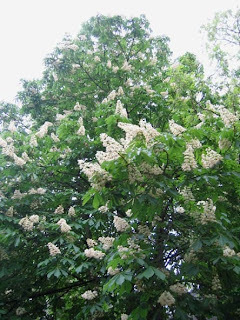 the horsechestnut (the photo shows a large specimen on Ewing), and black locusts. You may also see some fringe trees in bloom, a beautiful native that's more like a large shrub. Will they take this curbside? Saturday, a few hours before the baby owl plopped down into our garden from above, our dog was heard barking persistently near the neighbor's fence. I thought it must be someone's cat or dog that had roused Leo to such passion, but no. The snapping turtle that had been showing up in our minipond periodically over the last couple years (see April 22 post) had apparently decided to move on up the valley and got stymied by the fence. We decided to help it on its way, and so coaxed it into a recycling bin. Mr. Turtle headed first to the science teacher at Little Brook, who promised to release it the next day into a local waterway after a day's service in show and tell. This here's turtle country! The view is downstream, where once a tributary of Harry's Brook flowed, before it got buried beneath houses. 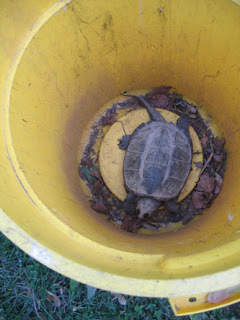 The largish snapping turtle had been making do with a pond that could get as small as three feet across and two feet deep in a summer drought. 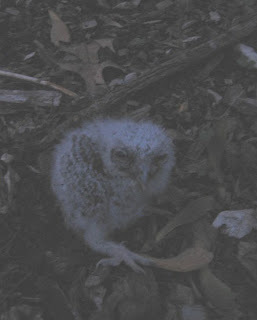 Saturday evening, just before dark, my daughter was amazed to find a baby owl in the garden. I had installed miniponds and native plant habitat in the backyard in part to attract wildlife, but this was totally unexpected. Not knowing what else to do, we put it in a shoe box with some mulch for bedding and brought it inside where it would at least be warm for the night. I did some internet research, and also put a call in to the Mercer County Wildlife Center. Internet sources suggested putting it back in the nest, or at least putting it back where we'd found it and waiting to see if the parent comes to retrieve it. Neither of these seemed practical in the dark. The next morning, a woman named Nicole at the Wildlife Center called back, and recommended taking it in to see if it had gotten injured by the fall. At this point, I went outside to see where it might have fallen from. Sure enough, the big silver maple in the backyard had a roomy hole about 25 feet up, directly above where my daughter had found the baby. Wishing to confirm that the hole had a nest, I raised a long bamboo pole up and gave the hole a tap. Out sprung an adult owl, surprisingly small, with two tufts of feathers on its head. It perched briefly on a limb before flying off. In its place came a raucous gathering of birds--a catbird, a robin, a bluejay, and some others--all with strong opinions about there being an owl in "my" backyard. Later in the morning, while at Mountain Lakes Preserve, I ran into the Princeton professor Stephen Pacala, who said it was likely a screech owl. While he was at it, being an international authority on climate change, he answered a few of my lingering questions about that issue. Later in the day, hopefully not having taken too much of our sweet time about it, we delivered the baby owl to the Wildlife Center, down along the Delaware River, not far from Lambertville. Nicole, reporting that the owl was cold and had a minor injury below its wing, immediately put it in an incubator. 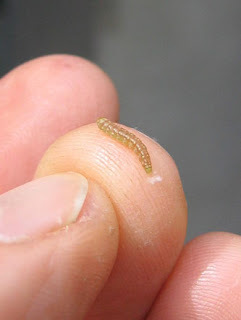 They would feed it "pinkies", which are baby mice, and if it survived and grew it would be put with an adult screech owl--essentially a foster parent from which it could learn how to call and how to eat. They would then release it in Princeton when it was strong enough to survive in the urban wilds. Though my daughters had given it names--Owlie and Bobo--the Wildlife Center gave it a new designation, Case #2009-327 . We are welcome to call and ask how it's doing. 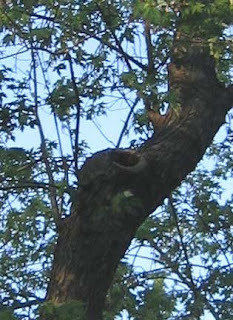 Www.owlpages.com says that screech owls like riparian woods along streams and wetlands .... and woodlands near marshes, meadows, and fields. A tree overlooking a series of backyard miniponds must have made the screech owl pair feel right at home. Workday at Mountain Lake, this coming Sunday, May 10, at 10am. 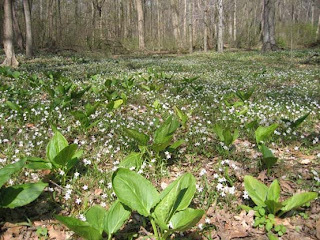 We'll be giving Mother Earth a brunch of her favorite wildflowers. This may conflict with some annual rituals, but it's what my schedule allows. There are more plants to get in the ground, and it's also a good time to be pulling garlic mustard. Shovels, trowels, gloves, boots, loppers--all useful. Meet at Mountain Lakes House, 57 Mountain Ave. You can drive up the driveway and park in the lot just before the house. 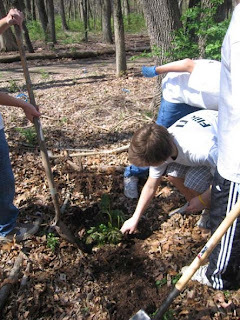 Workday at Little Brook Elementary School, Saturday, May 9, 10am. This is part of the school's annual cleanup of the grounds. There's a nice creek-fed wetland area that needs some removal of exotics and planting of natives. Same tools as above, if you have them. Projects for individuals: If you'd like to help out whenever you have some free time, there are some individual or small group projects that are timely at Mountain Lakes. One is pulling garlic mustard along the driveway. It's blooming now, so is easy to identify. 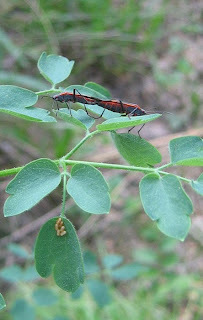 Another is pulling the small bush honeysuckles in the WHIP restoration area, just upstream of the lakes. 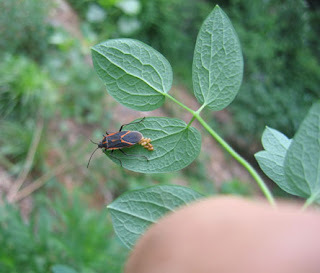 These are the legacy of some very large invasive honeysuckles that were cut down last year but had seeded hither and yon. They pull very easily in this wet weather. Contact me if you have an hour or two over the next two weeks. THANKS! to Brownlee, Steve Carson, Jamie and her children Anthony and Elizabeth, Christine Zeppenfeld and her son and daughter, and Annarie and her son, for all their help this past Saturday planting natives we grew in the FOPOS greenhouse. Christine teaches science at Princeton Junior School, and Steve C. teaches science at JW Middle School. The weather was misty moisty--perfect for planting--and the kids had a good time helping out, chasing frogs, and exploring. A group of Princeton Cares volunteers--this time 9th grade boys from Princeton Day School and Hun School--returned to Mountain Lakes Preserve to do more removal of invasives and planting of natives. Last year, they planted bottlebrush grass. This year, they pulled out some honeysuckle shrubs, then planted mayapples in an area close to the house. Their morning work done, the kids then headed off to do other good deeds in the community. The mayapples looked droopy in the sun, and the boys had wondered if the plants would survive. But they recovered over the next couple days, helped by all the rain, and should spread like a groundcover in coming years, helping to fill the void in native herbaceous species that still remains, more than a half century after this farmland was left to grow up in trees. A detention basin is a dug out area designed to collect rainwater from roofs and parking lots and hold it for awhile after storms. Usually they are designed without thought to their potential as wildlife habitat, and are planted with high-maintenance turf. When located at a high school, it sounds like a place where water is told to go when it's been bad. This basin was converted to a wetland, planted with native species and informally stocked with native frogs, fish and possibly a turtle. It is fed by an eternal spring, which is the romantic name I'm giving to the sump pump that sends groundwater from the school basement into the wetland every twenty minutes or so, year-round, rain or shine. 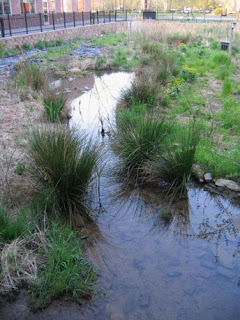 The steady water supply allows a greater variety of native wetland species to prosper. 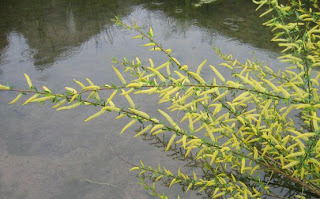 The blooms of a species of willow planted in the ecolab wetland were a pleasant surprise. 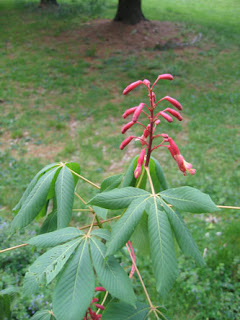 Though native, willow tends to be an aggressive grower that may need to be controlled to allow other species to coexist. 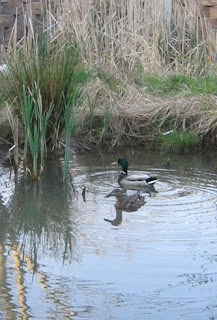 This spring, a pair of mallards showed up, and seemed to give serious consideration to breeding there. The new and newish bird observation platforms were dedicated last weekend. Fred Spar, on the right, is president of the Friends of Rogers Refuge (FORR) and gave a short speech thanking all those responsible for helping sustain the refuge. Tom Southerland, further back and to the left, told of the three Toms who were involved with saving the marsh back in the 60s and starting the Friends organization. 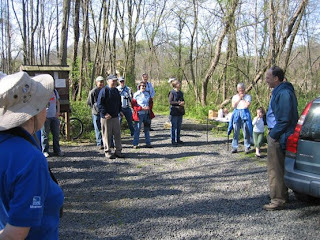 Tom Poole, Winnie Spar, Laurie Larson, representatives of the American Water Company and Princeton Township--many who have worked to save and restore this jewel and birding mecca were on hand. Afterwards, we took a walk around the perimeter of the refuge. 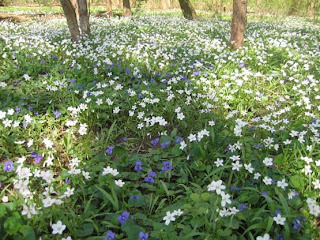 Here's a shot of violets mixing with spring beauties. 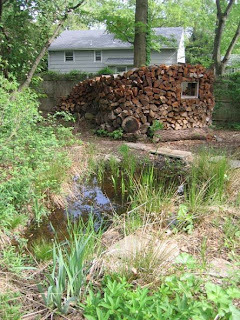 The scene is so "clean" because periodic floods clear the forest floor of debris from the previous year, creating an effect that rivals any meticulously cared for garden. Skunk cabbage and spring beauty made another fine combination. The oak leaves on the ground show that this area didn't flood over the winter. 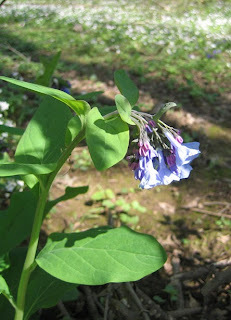 A solitary Virginia Bluebell was a very pleasing find. Though some of its stems had been browsed, presumably by deer, it was still able to flower. Without the township's program to bring the local deer population into ecological balance, flowers like this wouldn't have a chance. 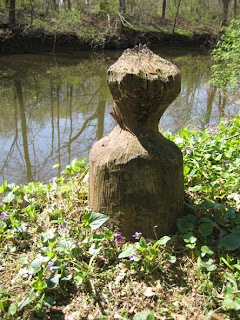 Nature's garden isn't complete without some sculpture, in this case rendered by a local beaver. I never gave these critters much thought. They appear this time of year, hanging from invisible threads on the eaves, or suspended from low tree limbs in the backyard. 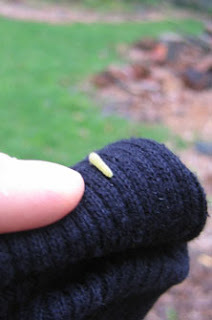 They land on the car, or on a sweater. You'll likely find their sudden appearance in spring coinciding with the emergence of tree leaves, which they like to eat. Right about this time, migrating warblers show up in Princeton to feast on the inchworms high in the trees. As spring moves northward, awakening forests as it goes, the warblers follow the wave of new growth, powered by solar energy transferred from tree leaf to inchworm to beating wing.